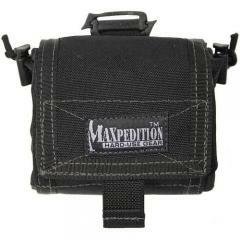 The Maxpedition Mega RollyPoly is a versatile, extra-large dump pouch for spent shotgun shells, dirty laundry and other miscellaneous items. It folds up neatly when empty for compact portability, and unfurls when filled to provide an impressive amount of storage space. It features a built-in loop for belt attachment, and can also be fastened to MOLLE or PALS webbing using three-inch TacTies. It also comes with an adjustable leg strap to prevent it from moving around when expanded. Its cinch-cord closure pulls tight to fasten the top of the bag, and is covered by a hook-and-loop flap for additional protection.